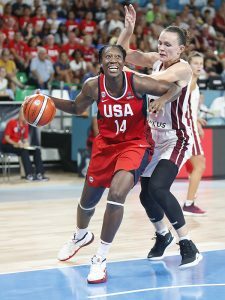 Tina Charles had 18 points and six rebounds against Latvia earlier this week. Photo by Catherine Steenkeste/NBAE via Getty Images. 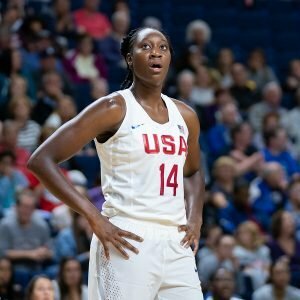 If any WNBA player embodies the adage, “speak softly, carry big stick,” it is Tina Charles. 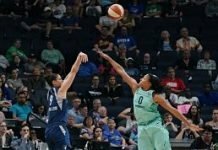 The veteran center held the New York Liberty down throughout the summer, averaging a team-high 19.7 points and seven rebounds per game. Now at the FIBA World Cup in Tenerife, Spain, Charles has put up an average 13.3 points in each of Team USA’s four winning routs so far, behind only teammates Breanna Stewart and A’ja Wilson on a star-studded roster. When Charles has spoken the last few weeks during her time with the National Team, it has usually been to praise her teammates. 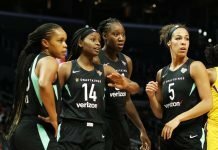 But head coach Dawn Staley said Charles deserves a lot of credit as one of only two veteran players present during camp, which was in session alongside the WNBA playoffs, and as the only one with Olympic experience. New York native Charles, who will turn 30 in December, helped Connecticut win two National Championships before being drafted No. 1 in 2010 by the Connecticut Sun, and then was named WNBA MVP two years later. Charles has been a league-wide stats leader and an All-Star each season. But for all of her accolades, she flies below the radar. That includes her off-court work with Hopey’s Heart Foundation. Charles formed the non-profit organization in 2013, after her aunt died of heart failure. One of the missions of the foundation is to install automated external defibrillators (AEDs) in underprivileged communities and recreation centers across the country, to ensure that lives can be saved in the event of a cardiac emergency. Tina Charles warms up before the recent exhibition game against Canada. Photo by Chris Poss. Unsurprisingly, however, Charles downplays the success of the foundation and her awards, saying the work is a fulfillment of service to others. But Charles’ contributions aren’t lost on Liberty coach Katie Smith. On the court, USA teammates Sue Bird and Diana Taurasi are the senior members of the squad, but that doesn’t mean Charles isn’t old enough to be teased by the rest of the young roster. Charles said she is trying to carry on the legacy of those who have mentored her, including Tamika Catchings. 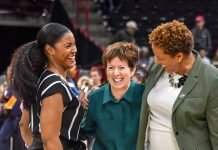 “How you approach every game, how you’re there for one another, especially on the bench, and just how you’re willing to be receptive to what the coaching staff needs from you are just things that I’m passing forward from what Tamika Catchings, Diana, and Sue did with me,” Charles said. 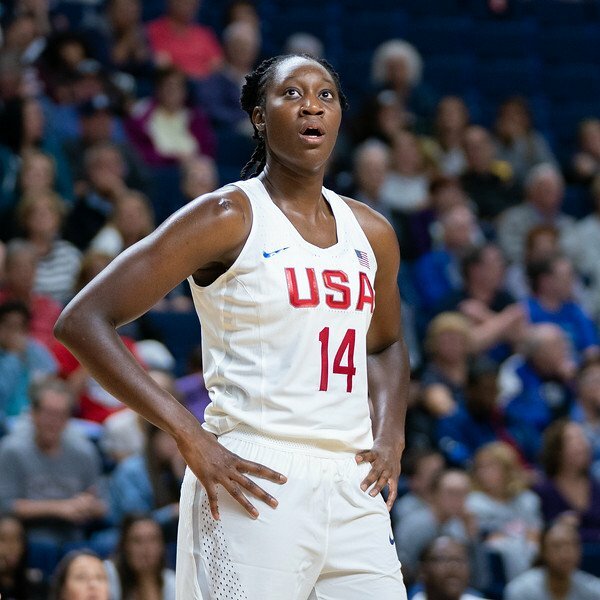 Tina Charles was the leading scorer and rebounder for the New York Liberty this summer. Photo by Chris Poss. 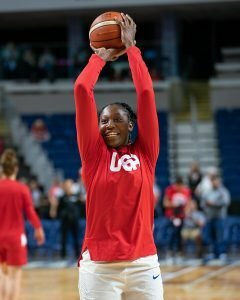 As Charles spends time with Team USA, she is in the midst of an important offseason with the Liberty, which finished a franchise-worst eleventh place this year. She will be a free agent next year, but said she desires to return to New York. For now, however, Charles is focused on helping guide the National Team to another gold medal, and she will likely execute quietly but deadly, just as she likes it. The U.S. plays Nigeria tomorrow in the World Cup quarterfinals.